This is a mail phishing scam and we are alerting consumers to not return the card or provide any personal information. The mailer doesn’t identify the name of the insurance company. The mailer doesn’t give an agent or broker to contact. The card gets returned to “National Processing Center,” which is not an insurance company. 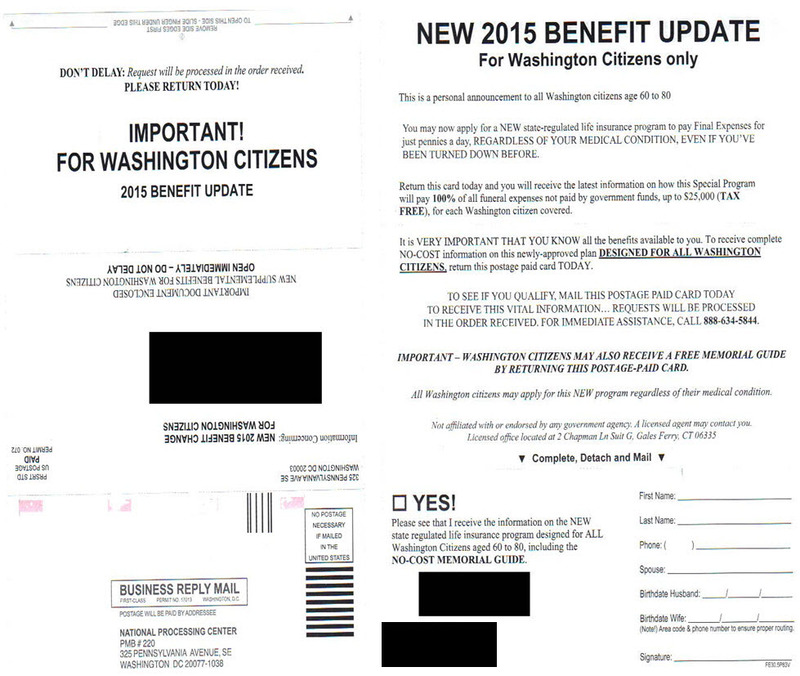 The mailer gives no information about the policy. The Virginia Better Business Bureau issued a consumer alert about the mailings in 2013. A handful of companies are authorized to sell final-expense life insurance policies in Washington, which typically are purchased to cover funeral expenses. Before you buy any insurance, you should make sure the person or company selling the policy is licensed to do business in this state. If you are interested in finding one of the companies that sells final-expense life insurance, you can contact our consumer advocates at 1-800-562-6900 for a list. Read more about life insurance and what to consider before you buy it.